In yet another incident of political violence in Kannur, a Bharatiya Janata Party worker was stabbed to death allegedly by Communist Party of India (Marxist) (CPI(M)) activists at Andaloor in Dharmadam, the constituency of chief minister Pinarayi Vijayan. The attack on Santosh (52) took place when he was alone in his house. Santosh, a booth worker of the BJP, is survived by his mother, wife and two children. In another incident, a country bomb was hurled at the Rashtriya Swayamsevak Sangh (RSS) Karyalaya at nearby Thaliparamba. The office was damaged. Though Santosh was rushed to the hospital, he died on the way. 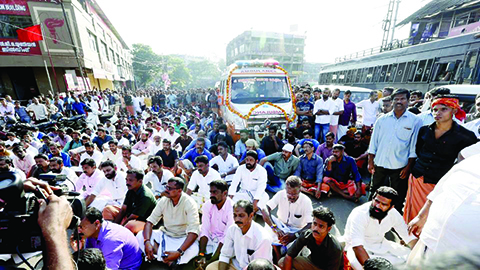 The district unit of the BJP, outraged at Santosh’s murder, had organised a hartal in Kannur on the 23 January and squarely put the blame for the incident on the ruling CPI(M). They also demanded an explanation from Chief Minister Pinarayi Vijayan, who hails from Kannur. During the hartal in the district Shops and businesses have downed shutters and vehicles are off the roads. BJP wanted to take out the funeral procession of Santosh but the administration denied them permission. On January 30 BJP observed fast in all district headquarters of the state. Noteworthy, there have been eight political murders after the CPI(M)-led Left Democratic Front (LDF) government came to power in May 2016. In the constituency of the chief minister, who looks after the home portfolio, four political murders had taken place so far. Within two months of peace talks chaired by the chief minister, four BJP workers had been killed and several others seriously injured. BJP state president Shri Kummanam Rajasekharan said at Kottayam that central forces be deployed to bring peace in Kannur in north Kerala. The party will make this demand before the home secretary. In Kannur city when government is organizing the school arts festival, CPI(M) workers are killing people in party controlled villages, he alleged. He said eight stabbing incidents were reported in January and country-made bombs were thrown at the house of a BJP worker in Thalasserry. Shri Kummanam Rajasekharan said that the party would make it a national issue. The BJP has taken a serious note of recurring cycle of violence in Kannur. Union urban development minister Shri M Venkaiah Naidu, asked the CPI(M) to fight BJP ideologically not through violence. He had warned the party of serious consequences if it continued to unleash political violence on its rivals. 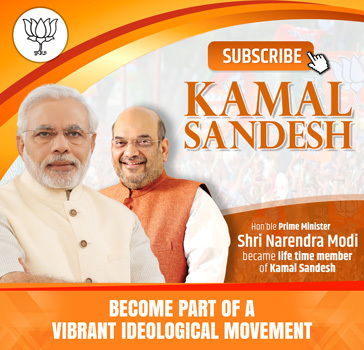 Six men affiliated to the CPI(M) were arrested in connection with the murder of BJP worker Santosh in Kannur district of Kerala. Police said the accused, aged between 25-31, were Marxist party workers and sympathizers hailing from Andaloor, from where the victim also belonged.